The S&P 500 index is trading within the sideways channel of 2919.9–2910.2. The market did not react to the interest rate increase at the last Fed meeting, but positively met the news about the revision of GDP from 2.8% to 3.1% for the current year, which reflects the strengthening of the economy. FOMC may slow further increase in interest rates due to the tightening of relations between the US and China because of trade wars. In addition, US President Donald Trump criticized the Fed because of another interest rate hike, which caused the reaction of debt securities: the yield of short-term and long-term bonds began to fall. Today, traders will pay attention to US data on Personal Expenses and Chicago Purchasing Managers' Index release. 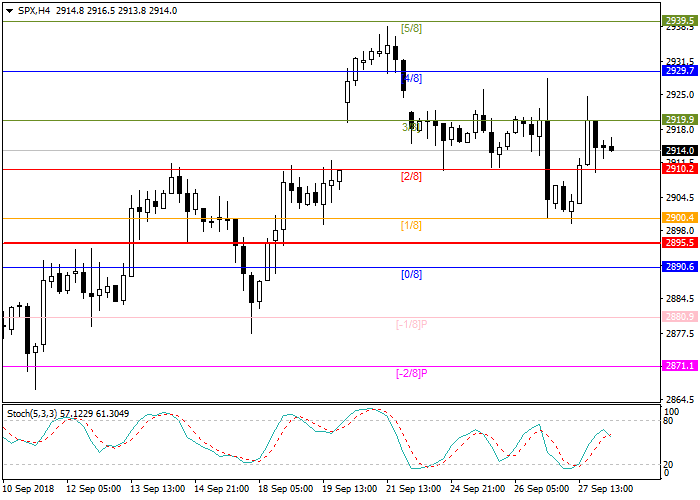 Stochastic is around 74 points and does not give signals for opening positions. Long positions can be opened after the breakout of the level of 2919.9 with the target at 2929.7 and stop loss 2911.0.